I had some of the Southwestern Bean and Rice Casserole leftover. I really did not want to eat it the same way. So I changed it up and made it into a cheesy gooey quesadilla with little effort. 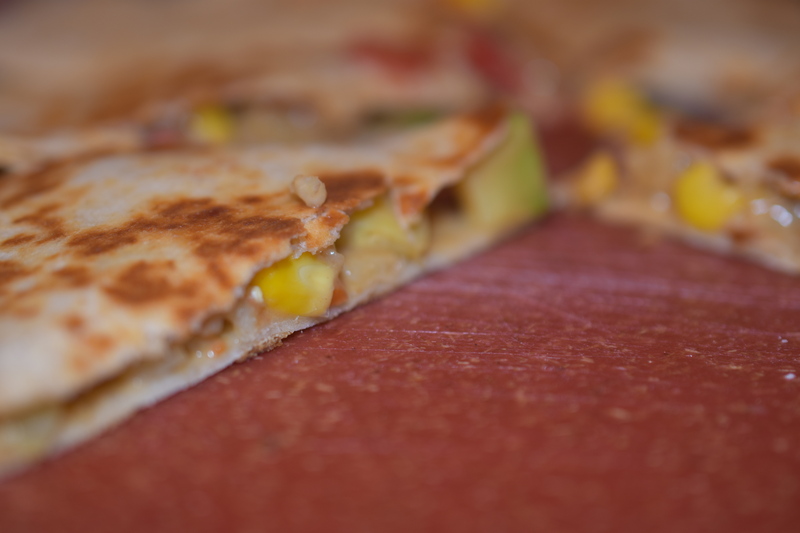 Top the quesadilla triangles with some guacamole, almond/coconut yogurt, or salsa. I do not know, I might try all three toppings. They all sound good to me. I am thinking some fresh grapes to go along with these little bites – Yum. Note: These are so easy to prepare. You could make these ahead and let the kiddos take them for lunch. Just wrap in foil, and use a little container for the condiments. This would be a nice change from the usual. Grease large skillet over medium heat. Place Quesadilla into pan and cook until golden on the bottom. Turn over quesadilla and cook other side until golden. Transfer quesadilla to a cutting board. Let set for a couple of minutes to cool. This makes it easier to cut. Cut into triangles with knife or pizza cutter. Serve with your favorite condiments. Eat. Enjoy. Note: These would be great for Any Game Day. They are really tasty. If you have made the Southwestern Bean and Rice Casserole you have most everything all ready. Thanks for stopping by.